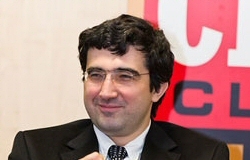 TWIC - Vladimir Kramnik drew comfortably in his final round game against Levon Aronian to take clear first place in the 3rd London Chess Classic. Kramnik beat the four English players and drew with the rest. Magnus Carlsen could have caught his points total but he was held to a draw by Nigel Short. Luke McShane was drained from the effort of the day before and took a quick draw against Viswanathan Anand who said he would almost immediately be starting to prepare for his match in May against Gelfand. He called his recent results a "disaster" for which he had no explanation. 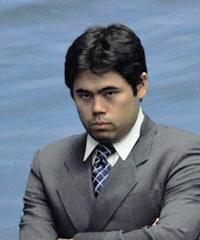 Hikaru Nakamura took a lot of risks using the King's Gambit against Michael Adams but after the latter missed a win in time trouble Nakamura brought home the full point to finish second. The memories of a year earlier when the 4NCL adventure began for the Spirit of Atticus came flooding back when we were greeted this year, as then, by a beautiful sunny November morning. The butterflies in the stomach that were in place in anticipation of the unknown last year were active this time with the prospect of upgrading ourselves from medium sized fish in a small pond to life in the big pool. 17.11.11 - Two of the top 2012 Masters competitors locked horns in battle for the Women's World Championship in Tirana, Albania. 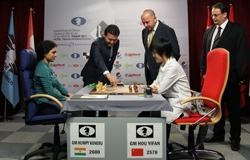 Hou Yifan retained her title comfortably 5½-2½ after only 8 of the 10 games. The match took place 14th - 24th November. Men: Mickey Adams - Gold: board 1 (Mickey had the best TPR of anyone on board 1); Zoltan Almasi - Silver: board 2; Shakhriyar Mamedyarov - Gold: board 3. Women: Anna Muzychuk - Gold: Board 1 (with an amazing 8½/9 and a TPR of 2782! ); Nana Dzagnidze - Bronze: Board 1; Tatiana Kosintseva - Gold: Board 2; Maria Muzychuk - Silver: Board 5. It's especially nice that both Muzychuk sisters won medals. Of course Anna's result is out of this world! The ETCC was a nine-round Swiss, with one open section and one section for the women’s teams. Another update for the Masters and Challengers 1 & 2 has been posted. New entries are being received all the time so regular updates will be made. In the Masters we now have 39 GM's, 13 IM's, 7 FM's amongst others in a total of 108. Currently nine of the top ten players are rated over 2700. Full details here. Mickey Adams has won the British Championship sponsored by Darwin Strategic Limited after a dramatic tie-break playoff with Nigel Short. Both Adams and Short finished the 11-round event with 8½/11 which then required a 2-game play-off to decide the title. The 89th Championships took place at Ponds Forge, International Sports Centre in Sheffield, 24 July - 6 August. After a draw in the first rapid game, Adams won the second to successfully defend his title and claim the championship. 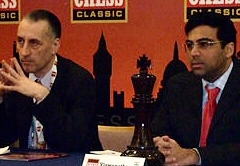 Mickey Adams and Nigel Short are joint winners of the English Chess Championship 2011. They will jointly hold the Tony Miles Trophy. Jovanka Houska also defended her women's title after finishing the best placed woman on 7/11, making it her fourth British title. TWIC - The 2011 London Chess Classic is the strongest yet with World Chess Champion Viswanathan Anand and World Number One Magnus Carlsen returning. 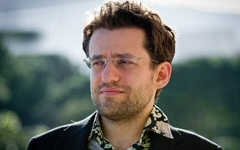 World Number three Levon Aronian is a new invitee as the field is extended by one. The full field will be announced shortly. 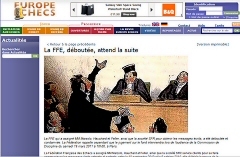 Read the new press release of 4th July 2011 with the dates of the rounds and side events. There will be two extra rounds, as the addition of one more top flight player to this year’s main event will make it a nine player all play all. One player will sit out each day and keep the spectators at Olympia and online, doubly entertained by joining the commentary team. The English players will again be led by the UK number one Michael Adams and former world title challenger Nigel Short and David Howell. Chessbase - The 5th edition of the Kings‘ Tournament is over. The leaders’ game Carlsen-Karjakin finished in a draw after 30 moves, when neither player was willing to take too much risk. Thus both players shared 1-2 places. According to the tie-break rules the first place is taken by Magnus Carlsen. 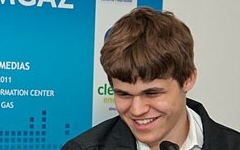 On his blog Carlsen wrote: "I’d like to forget my game against co-leader Karjakin as quickly as possible. On another off-day (the first was round six against Nakamura), I really missed a lot and quickly squandered my slight opening advantage. Knowing that a draw would provide the 1st prize on better tie-break and 1st place on the July 1, 2011 FIDE rating list, the result itself was fully acceptable today." [Full report with pictures]. 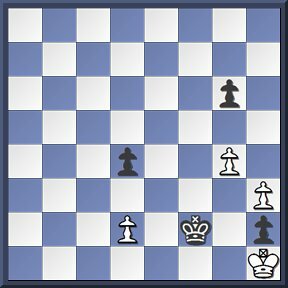 TWIC - Magnus Carlsen defeated Vassily Ivanchuk in an ending that should have probably been held comfortably by the Ukrainian. Ivanchuk has been playing quite quickly during the tournament a sign he is out form. 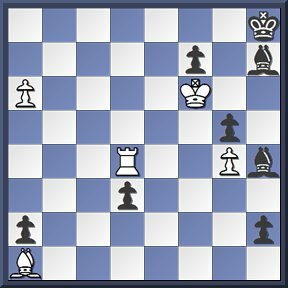 TWIC - There are strong indications that Garry Kasparov is about to play another exhibition rapid match, this time against his former challenger Nigel Short. 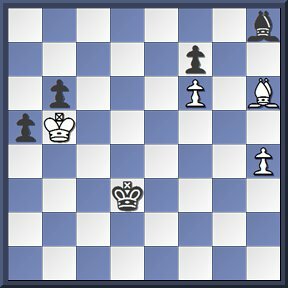 TWIC - Grischuk's novelty of 8.Be2 in the Queen's Gambit gave him an edge against Gelfand in game five. Gelfand played f6 with the idea of e5 but then decided it was too dangerous. Grischuk didn't find a decent attacking setup and after 22.Bg4?! allowing 22...e5 Gelfand equalised and a draw was agreed a few moves later. Chess can never be dull or can it? In Kazan nervous energy has created a drama-less predictable match between Grischuk and Gelfand, with their 3rd game (of 6) lasting only 14 moves. Game 4 today also ended drawn after 18 moves after they repeated the English Opening played in game two. World Champion Anand awaits the outcome but probably with little interest. The likelihood of either player getting a chance to challenge for the World title seems slight and the King's ransom required to fund such an event unlikely to be forthcoming. Earlier this year discussions about a World Championship match in London 2012 broke down when FIDE and Chess Promotions Ltd., could not arrive at an agreement. New possibilities emerge though and it's no secret that Anand and Carlsen, the two highest rated players currently, like London, get on with each other and crucially, play dramatic high quality chess. Game 5: Grischuk-Gelfand is Tues 24th 12noon UK time. Official site. It was in high spirits but with some apprehension that we set out for the final weekend of the 4NCL not only to play in the combined 3rd Division but to enjoy the company of the great and the good of British [indeed European] chess settling down to do battle in the 1st and 2nd divisions. For the first time in the tournament we had been struggling to field a full team for the weekend but an approach to a former Atticus regular, albeit her last game played was thirty two and a half years ago, [still short of Andy Mort's all time record] found Sheila Jackson responding enthusiastically to the call. Spirit of Atticus have been drawn against Wessex 2 in round 9 on Saturday 30th April. Play starts at 14:00 at Hinckley Island. Results will be posted online as soon as possible after the end of the games with a PGN to follow. At the final weekend Division 3 and the Northern League combine into a single division, with match and game points carried over from the first four weekends. Pairings for Rd10 will be published at the venue following completion of round nine. Pairings for round 11 will be published after completion of round 10. Click to see all Div 3 Rd9 pairings. The 2011 U.S. Championship and 2011 U.S. Women’s Championship take place April 14-28 at the Chess Club and Scholastic Center of Saint Louis. The games were broadcast in a daily live show with GM Maurice Ashley and WGM Jennifer Shahade, produced by Macauley Peterson. The full 4+ hour live show was also available for replay in four parts each day at www.USChessChamps.com/video. This looks like a straightforward position. Although a pawn down, White's got Black in a real jam. But those two connected passed pawns have the potential to be quite troublesome. What is White's best line of play? 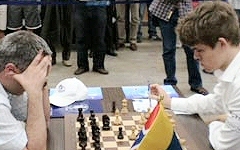 German GM Jan Gustafsson (above right) threw the 2011 Thai Chess Open in Pattaya wide open by defeating tournament leader Nigel Short in the seventh round. Gustafsson, seeded third, now shares the lead with top seed Paco Vallejo and the two will meet in a much-awaited penultimate round encounter on Saturday. Chessvibes reports: In May 2010 the Bulgarian Chess Federation, after organising the Anand-Topalov World Championship match, took Chessbase to court for “violating copyright rules”. Chessbase had transmitted the moves of the match live on their Playchess server, without permission of the Bulgarians. Recently in a court in Berlin all demands of the Bulgarian Chess Federation were rejected. This position could easily occur in a normal game and Black, with an active King and passed pawn, is hoping White slips up. 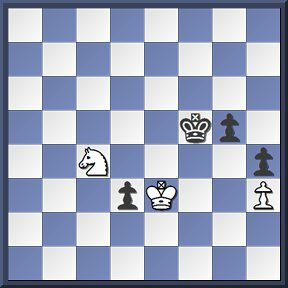 With a clever knight manoeuvre White however shows how to snuff out the few remaining threats and deliver checkmate. Spirit of Atticus have been drawn against Wessex 2 in the next round of the 4NCL Division 3. Play starts at 14:00 on Saturday 30th April at Barcelo Hinckley Island. Note: At the final weekend Division 3 and the Northern League combine into a single division, with match and game points carried over from the first four weekends. Pairings for Rd10 will be published at the venue following completion of round nine. Pairings for round 11 will be published after completion of round 10. K+P endings are easy, agree? Sometimes we assume that pawn endgames are just a matter of counting, and that can be true. But such endings also require precision or even perfection. A careless error can turn victory into defeat and in this example White has some tricky choices to make. What would you play here? 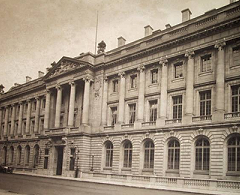 This year the Royal Automobile Club is celebrating the centenary of its Pall Mall Clubhouse. In order to mark the occasion and the founding in 2011 of its Chess Circle, a 100 board simultaneous is being held on Saturday 16 April at the Clubhouse in Pall Mall. In a truly unique format, ten of Britain’s highest-rated grandmasters are taking part: Mickey Adams, Luke McShane, David Howell, Julian Hodgson, Gawain Jones, Nick Pert, Stephen Gordon, Jon Speelman, Simon Williams and Jovanka Houska. At first glance it looks as if White is dead lost but there is a remarkable winning line that turns the tables. Dramatic news that the Auditorium at Olympia had been closed for a year due to structural damage was an April Fool's prank. At least one British senior arbiter was taken in. The London Chess Classic takes place a little earlier this year on 3-12 December and will involve 9 players, one more than usual. The official site has more information. Chessbase 2006: In the past years our web site has published a series of elaborate April Fool's stories. Not this year, and not any more. An international watchdog group which calls itself the League for Truth and Veracity, is threatening news services as well as private pranksters all over the world with lawsuits for publishing false information. This unfortunate activity spells the end of an old tradition. The 3rd London Classic has been rocked by news that the Auditorium at Olympia will not be available for use during the event. Routine maintenance work revealed a 'very deep and dangerous crack' at right angles across an external wall. Part of the conference centre has been closed to the public and structural engineers have estimated work could take 'up to 12 months to repair ... if we're lucky'. Implications for the chess are dramatic. The Classic could either be withdrawn as a separate event or take place within the same hall as the FIDE Open. A more dramatic idea currently being explored is that the Classic and FIDE Open are combined into one event. The Classic organising committee have been quoted as saying 'nothing is ruled in or out at this time but if we have to go the moon and back we'll find a solution'. It has been reported widely that the recent cheating case investigated by the French Chess Federation is affecting the players and the atmosphere at the European Championship in Aix les Bains. It has led to the players signing an open letter demanding that additional measures be taken to prevent any form of unfair assistance during the games. One item on the letter is that 'electronic boards can be unplugged if one of the players demands it'. If such a request is allowed it could have quite dramatic effects on the LIVE broadcasts at 100's of major chess events. FIDE, arbiters or even sponsors, nervous of the damage cheating allegations might have on their events, could join forces with the players and change the way chess is broadcast for good. See the latest coverage on Chessbase. There was a feeling of familiarity on our return to Wychwood Park on the outskirts of Crewe, not only for the prospect of the welcoming venue, but the awareness amongst the the Spirit of Atticus team of a tough match in prospect on the Saturday. 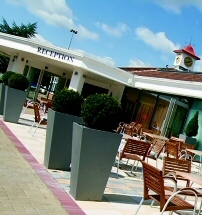 Barcelo Hotel, Hinckley Island Divisions 1, 2 and 3 & Northern League. 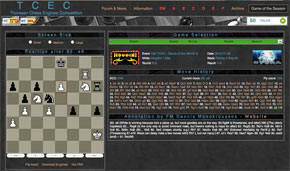 TWIC - The 3rd London Chess Classic has been announced on 26th March 2011. The event will take place 3rd-12th December 2011 and will again be at the Olympia Conference Centre. This time there will be an additional player making it a 9 round 9 player event. 1 player per round will have a day off and help the commentary team. In the tradition of promoting chess in the UK there will be junior training, lectures, GM and amateur opens. Read more. The 2011 European Individual Championship (Mixed) is currently underway, and will run from March 21st to April 3rd in Aix-Les-Bains, France. The first round is on March 22nd, and the last on April 2nd, with no tie-break matches to decide the final places. Besides determining the title of European Champion, the top 23 finishers also qualify for the 2011 World Cup. 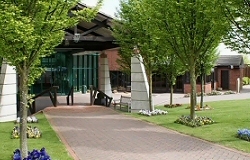 Rounds 7 and 8 in Divisions 1 and 2 take place at Staverton Park, Division 3s at Barcelo Daventry and Div 3n (NL) meet at De Vere Wychwood Park (pictured left). Spirit of Atticus will play Holmes Chapel in round 7. Pairings for round 8 (jamboree) are shown here. A decision about our teams' precise board order is being finalised by skipper John Carleton. Click for more 4NCL news on the 4NCL site.  Chessvibes: On Saturday the Disciplinary Committee of the French Chess Federation suspended GMs Sebastien Feller and Arnaud Hauchard and IM Cyril Marzolo, saying they are “guilty of a violation of sporting ethics”. The Committee concluded that there was enough proof that the three players cheated during the Olympiad in Khanty-Mansiysk, in September last year. Mark Crowther - TWIC (Mar 19): Levon Aronian leads the Amber Chess Tournament by half a point after 7 rounds. 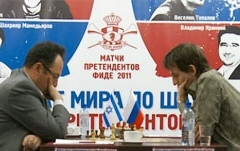 That he has a lead at all came courtesy of a typical blindfold blunder by Boris Gelfand who forgot where his opponent's knight was. Steve Giddins has deleted his blog. This a big blow and a decision which will not have been taken lightly. He is one of the UK's top chess journalists, highly regarded and author of many top chess books. One imagines he was tired of becoming a target. At a personal level this is bad enough but when it had the potential to spill over into his professional life, Steve, like others with intelligent things to say, decided enough was enough. The tipping point seems to have been the prejudicial comments about his recent article 'Tournament Raider' which detailed the deceit and trickery employed by WGM Lara Stock (rated 2346) and her father Michael Stock (rated 2275) who competed in an event for U1700's in New Zealand under false names. Their involvement was initially treated as a joke but it seems this pair have been travelling through Australia and New Zealand for a while and they’ve also tried to enter other weak tournaments. British Chess has been suffering a haemorrhage of top level skill for some years and worse, there are few signs that this will change anytime soon. The tantrums, snide comments and a disregard for common-sense on bulletin boards, including the behaviour of some officials, drown goodwill and energy. It is no surprise when those with something worth listening to, step back and decide to pursue their chess interests elsewhere. The French Chess Federation is not allowed to use SMS text messages as proof for their claim that GMs Hauchard and Feller and IM Marzolo cheated during the Khanty-Mansiysk Olympiad. This was ruled by a Nanterre court judge on Thursday. Yesterday, however, there was news, brought by the French Chess Federation and made available in both French and English here. Cheating at the highest level in chess is rare but in amateur leagues cheating and collusion comes to light all too often. A recent example being ably demonstrated by this article. Such practices should not be tolerated but in the absent of any moral authority they thrive. One of the most publicised and famous cases of collusion in GM level chess took place in 1962 during the Curacao Candidates Tournament when the three top finishers, Petrosian, Geller and Keres drew all twelve of their games against each other, in an average of only 19 moves. It seems early to be talking about an event that doesn't start until late July but making arrangements for your accommodation and getting your entry into the system now would be a shrewd move. Ponds Forge International Sports Centre in Sheffield, the venue for this year's Championships is being hailed as one of the best for years and London Classic competitors Nigel Short, Mickey Adams, Luke McShane and David Howell are all scheduled to play. Detailed information is available on the official site with news about increased prizes. There are several sections: The Barceló Open, Imperial Major, Median, Intermediate, Minor and Standard. The third weekend took us to the luxurious Yorkshire spa town of Harrogate to play in the aptly named Majestic Hotel. Rounds 5 & 6 in Divs 1 & 2 take place at De Vere Venues, Wokefield Park, Berkshire, Div 3s at De Vere Venues, Sunningdale and Div 3n at Barcelo Majestic Hotel, Harrogate. Matches start on Saturday at 14:00 and Sunday at 11:00. 4NCL website. For years and years it was Fritz. Then, when top GMs analyzed their games for a chess magazine, sometimes they would mention other engines, like Shredder, Hiarcs or Junior. Then, around 2005, Vasik Rajlich’s Rybka started to rule the chess engine scene like Kasparov had done in regular chess. Eventually, in July 2008, Chessbase had to admit that Fritz wasn’t the strongest anymore, and started selling Rybka ... [Read illustrated report in full]. The tenth Aeroflot Chess Open features a prize fund of 125 000 euros. Top seeded and favourite for the first prize (20,000 euros) is GM Gata Kamsky, who is leading the list of participants in Aeroflot A. He will have strong competition, facing the new Armenia player GM Sergey Movsesian, GM Dmitry Jakovenko, GM Maxime Vachier-Lagrave, GM Wesley So, GM Alexander Motylev, GM Nikita Vitiugov, GM Dmitry Andreikin, GM Emil Sutovsky, the ex World Champions Kasimdzhanov and Kosteniuk, as well as close to 100 players above 2550 ELO. Tournament A and B: 100 mins the first 40 moves, 50 mins for the next 20 moves and 15 mins for the rest of the game with an increment of 30 secs per move, starting from the first. Tournament C: 90 minutes for the whole game with an increment of 30 seconds per move from move 1. The pairings for the World Championship Candidates Matches have been announced by FIDE. The matches will take place in the Russian city of Kazan from the 3rd-27th May. The winner of the Candidates will challenge Vishy Anand for the title next year but the venue and conditions are far from clear following the withdrawal of the London bid. The winners of the bottom and top matches face each other in the semi finals. The two favourites, Vladimir Kramnik and Levon Aronian will meet in the semi finals if they win their first matches. The quarter finals and semi finals will be the best of four games and the final is the best of six with Rapid Chess tiebreaks. 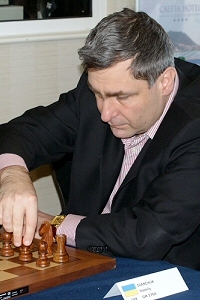 Vassily Ivanchuk has won the Gibraltar Masters tournament with 9/10 (+8,=2,-0). Runner-up Nigel Short scored an impressive 8½/10 (+8,=1,-1); he was one of Ivanchuk's 'victims'. Ivanchuck's win today against Daniel Fridman typified his play in this tournament - unforgiving and relentless. Short commented during the event that 'it's almost impossible to prepare against the guy so I decided to just play some random opening'. Other players found this to the case as well, and Ivanchuk now picks up a nice winners cheque of £17,500. Short in clear second receives £8,000. The impressive prize fund also sees a £10,000 prize being awarded to the highest placed female player and that went to Nana Dzagnidze (Georgia) who just pipped her fellow countrywoman Salome Melia. The big news at the gala dinner was that Judit Polgar would play at the 2012 Tradewise Gibraltar Masters. Ivanchuk has been a leading player in the world since 1988, at times reaching the second spot on the Elo rating list, but has never won the World Chess Championship. Ivanchuk often has erratic results, and since 2007 his world ranking has ranged from twelfth to second, before dropping to 30th in July 2009. From Chessbase: 30.01.11 - Nakamura won his first Super GM event, with 9.0/13, ahead of Anand, Carlsen, Aronian and Kramnik. His 2879 performance will bring him more than 20 Elo points on the next list. McShane and Navara drew and tied for first in B, after Luke found a fantastic save in a seemingly hopeless ending. In C, Vocaturo sacrificed two rooks and a piece to draw against Nyzhnyk and take first. This event took place from January 14th to 30th, 2011 in the traditional De Moriaan Center in Wijk aan Zee. There were three Grandmaster Groups, with 14 players each and each competitor playing against every other. The rate of play was 100 minutes for 40 moves, then 50 minutes for 20 moves and finally 15 minutes for the rest of the game, with a 30 seconds/move increment starting with the first move of the game. Games began at 13:30h local time (CET), except for the last round on January 30th, which began at 12:00h. There were three rest days, on January 19th, 24th, and 27th. It was a big sporting weekend in Crewe with Port Vale the visitors to Gresty Road on Saturday to play the Alex [The match of hate as it is known locally since Stoke's fairly recently acquired lofty status]. Chessvibes - The F.E.B. #6 is out! The London Chess Classic, Magnus and company, 2800s galore, Gashimov wins Reggio Emilia, previewing Tata, plus, trouble with the law redux, and the F.E.B. gives away its first prize. The Full English Breakfast started life as a late night brainstorm at the 2009 GibTel (now Tradewise) Chess Festival in Gibraltar. Trent and Macauley struck up a conversation about things missing in the chess media, and hit upon the idea of doing a podcast combining the serious with the slightly sophomoric. Trent quickly brought in his pal Stevie G. dramatically raising both the intellectual and the dialectical heft of the new ensemble. And the rest, as they say, is hysterical. Our Mission: Bring the serious chess news analysis. VERY serious, and not at all witty. DEFINITELY not tongue in cheek. You can subscribe to The Full English Breakfast via iTunes at TheFeb.com. Click here to add it to your iTunes podcasts directly. 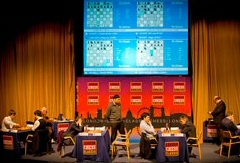 The London Chess Classic has been another resounding success on all fronts. The London Chess Centre is the only place to get official Classic 2010 merchandise - get your part of chess history now, while stocks last! The London Chess Centre is Europe’s biggest chess shop and chess resource. They stock everything you need to enjoy the game. Unlike most online stores their shop is located in the heart of London. Their mail order service is second to none and they ship worldwide. Click to see all the Classic souvenirs on sale. Humans, like all primates, often show behaviour largely dictated by social status and prestige. This applies to practically everything we do: the way we talk, the way we do business, the way we do politics, and the way we play chess ... full story. Occasionally in life we come across colleagues, neighbours, even chess players who seem to possess little more than the most basic social skills, not far removed from primates. The self-centred, self-obsessed lives they lead is certainly not an example to follow and their inept attempts to improve the environment they 'control' is amusing to see, at one level. Then again if the lunatics get control of the asylum, or the monkeys control of the zoo what can one expect?! An updated 29 page PDF of the London Chess Classic report is available for download. It now features clickable adverts (pages 15 & 29) so you can subscribe directly to CHESS, buy the January issue, visit the webshop, buy back issues or buy Classic 2010 souvenirs. Rounds 3&4 in Divisions 1-3 take place at the Barcelo Hotel Hinckley Island on Sat 15th & Sun 16th Jan. The matches start at 14:00 on the Saturday and 11:00 on the Sunday. Spirit of Atticus who meet at De Vere Wychwood Park (near Crewe) for rounds 3&4 in the Northern League will play Cheddleton 2 on Saturday and Jorvik on the Sunday. Click for full details. 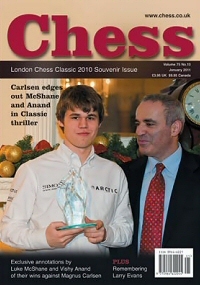 Download CHESS Magazine's coverage of the London Chess Classic 2010, a full tournament report featuring round-by-round coverage of all the best games and featuring exclusive annotations from world champion Vishy Anand and England's Luke McShane. The 2nd London Chess Classic saw another victory for Magnus Carlsen who ends the year atop the rating pile again after a rather uneven 2010. The tournament attracted many more spectators, the auditorium was regularly full and the commentary room packed to overflowing. The event received a huge number of plaudits for the online coverage which set new standards with live audio, video, telestrated boards and post game analysis from the players themselves. The commentary team of Danny King, Chris Ward, Jonathan Rowson, Lawrence Trent and Stephen Gordon were enjoyed by over 160,000 users. Click to purchase the full magazine for £3.95 or take out a new subscription to CHESS Magazine at the special rate of £25 (readers in the UK) for 12 issues (RRP £44.95). Steve Giddins reports - In a dramatic last round at the Sussex seaside, it was the Indian players Deep Sengupta and Arghyadip Das who emerged as joint winners of the 2010/11 Hastings Masters. The first-named faced the overnight leader, Romain Edouard, on top board and played a splendid attacking game against the French GM's Sicilian. The black king ended up on f8, and as lines opened, Sengupta penetrated decisively with his heavy pieces. 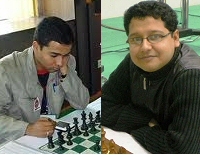 The other co-winner, Das, achieved his success at the expense of his compatriot, Shyam, who needed to win to make a GM norm. However, his Scotch Game soon went wrong, and he was left defending a hopeless ending, which he was unable to save. Istratescu and Howell drew a balanced game, as did Gormally and Prasanna. The latter result gave the 16-year old Indian talent a GM norm, on which we congratulate him heartily. Gerhana Chkartina of Indonesia won to secure a WIM norm, but sadly, other norm-seekers were less successful. Adam Ashton could only draw with Furman, and Griffiths lost against Bates, when only a win would do. Final positions: 1-2 Sengupta, Das 7/9, 3-8 Gormally, Howell, Istratescu, Prasanna, Edouard and Neverov ... 103 players ... more. Chessbase - Magnus Carlsen was the world's top player from January to November 2010, when he was overtaken by World Champion Viswanathan Anand. In the past two months Anand gained six more points, but the 20-year-old picked up twelve to regain his top ranking. Magnus' perennial rival Sergey Karjakin gained 16 points to enter the top-five bracket. Top 100 list. Armenian GM Levon Aronian has maintained his third ranking after gaining four points, staying in that hallowed 2800+ slot. His main rival, Vladimir Kramnik, lost seven points and is now 21 points behind Aronian. On place five we are startled to see another great young talent, ten months older than Magnus Carlsen (and his natural-born rival): Sergey Karjakin, who gained 16 points to make top-five. You probably know that back in 2002 he smashed all records by making his full GM title at the age of twelve years and seven months. In the women's list not much has happened: The first eight places remain unchanged, with three players now rated above 2600. Pia Cramling has dropped from place nine to 12, allowing Viktorija Cmilyte to climb to her slot from place 13. Harika remains the top Indian after the second highest ranked female player of all time, Koneru Humpy.